A big hello to all the readers of The Singapore Gadget Talk Show. My name is Alan and this is my 1st post on this blog. In this post, I will take you through a thorough review of one of the gadget that I use everyday-Belkin USB 2.0 7-Port Hub. The part number of the device is F5U237-APL-S and it is silver in color. Let me start by giving you a rundown of the specifications of the device. This device is listed on Belkin’s website as a desktop USB hub. (I think it is due to the size of the power brick.) I am using it with my MACBOOK (I am a laptop person. Desktop is not my thing.) at home as my MACBOOK only has 2 USB ports. Whenever I am home, I will just grab my MACBOOK out, plug in the USB port of the USB hub to 1 of my USB port on the MACBOOK and power up the USB hub. On the USB hub, I left my Genius pen tablet, external Samsung DVD writer and HP Deskjet F2235 All-In-One connected. So whenever I need to use the devices, I will just need to switch on the power for the devices and they are good to go. 1 feature that I really like about the USB hub is the LED lights on the front of the USB hub. 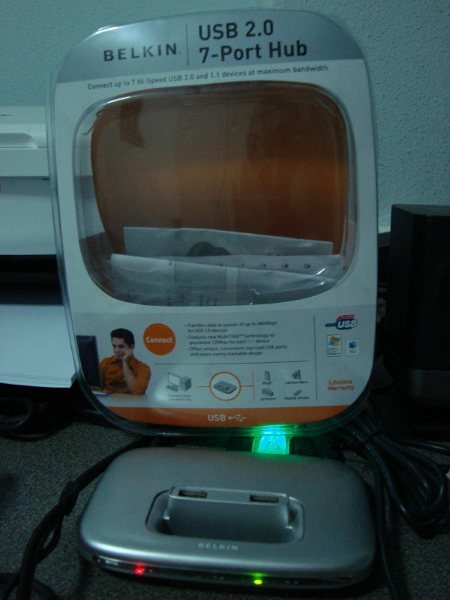 The LED lights give the user a good view of the status of each of the USB port on the USB Hub. 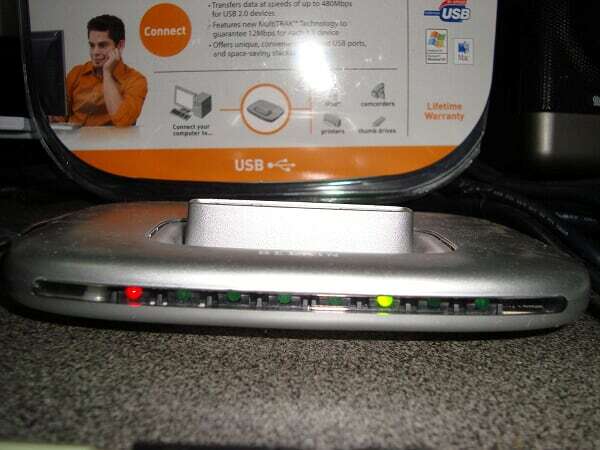 If a device is powered and connected to any USB port on the USB hub, the corresponding LED light will light up in green and the device should be detected by the PC. If the LED light does not come on after a device is powered and connected to a USB port on the USB hub, something is wrong somewhere. This makes device troubleshooting a lot more easier and ensure that Plug-and-Play do not become Plug-and-Pray. As this USB hub that I am using now is a replacement to my previous Belkin USB hub that was dead, I will like to talk about another plus point of this device-Lifetime warranty. The previous Belkin USB hub that I used was exactly the same as this 1. Just that it was in black color. It went dead after 7 to 8 years of use (Quite long longevity.) as the LED lights for some of the USB ports came on even though I did not plug in any device. Even if I plug in a device into the affected USB ports, the device does not get detected. So the usual process of RMA is to call the technical support of Belkin and go through various levels of troubleshooting before they will grant the RMA. As I am dead sure that my USB hub was dead, I felt that to be an absolute waste of time. The problem with Belkin technical support is that they are outsourced. So the folks at the call center assume that the callers are noobs. (Which I am not.) So they tried to put me through all the levels of technical support but I will cut them off and force them to give me a case ID. After I got the case ID, I went straight to Ban Leong (Belkin’s distributor) and they gave me the replacement. So Belkin owners, learn this trick! In terms of the design of the USB hub, the 2 top loading USB ports are good for easy connection of USB thumb drive or portable USB hard disks. (I call them palm drives.) The USB hub is also stackable when you connect them via daisy chain. The power supply to each of the USB port on the USB hub is also good as it can power up USB hard disks reliably.